Your child deserves a healthy smile and proper dental care. The Smilistic Dental Care team loves kids and helping them grow into healthy adults. At either end of the age spectrum, the bases are covered. Preventing cavities and promoting good oral hygiene should start early on in life. Taking great care of your child’s teeth now sets them up for great oral health in the future. Dr. Rajeev Trikha and the staff at Smilistic Dental Care are experienced in pediatric dentistry. Babies and children have specific dental needs and our professional staff is trained to provide the care they need. Contact us at 508-699-2626 to make an appointment for your child today. It’s never too early to have great oral health. It is recommended by the American Academy of Pediatric Dentistry (AAPD) and the American Academy of Pediatrics (AAP) that a dental visit should occur within six months after the presence of the first tooth or by the time your child turns one. Enjoy the peace of mind of healthy teeth and gums from infancy to adulthood. 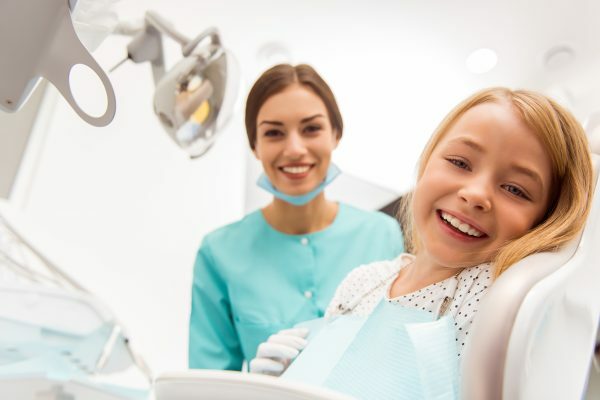 Visiting the dentist frequently and from an early age will help in the identification and prevention of potential dental problems before they become serious. Sealants are a great way to protect against tooth decay and cavities on your back teeth (molars). These are the teeth that are most vulnerable to cavities and decay because they are used in the chewing process, and are the most difficult to reach and clean. Molars first come in at around 5-7 years of age, with a second set coming in between the ages of 11-14. It is best to have a sealant placed when the molars first come in to ensure they are protected early. To place a sealant, an adhesive is first applied to the teeth. The sealant is then placed over the adhesive as a liquid, as if it is painted right onto the tooth. The liquid then hardens and creates a barrier between your tooth and any plaque, food particles, and bacteria. Sealants last for about 10 years and can be reapplied if necessary. Wearing a mouth guard helps prevent structural damage to your teeth and jaw and also helps prevent injuries such as lacerations to your cheeks, tongue, and lips. Mouth guards have also been shown to help decrease the risk of concussions. For the highest level of comfort and protection, you should visit your dentist for a custom mouth guard fitting. A custom mouth guard is created specifically for the optimal protection of your child’s mouth. It is created with thin plastic that is hardened to protect the teeth. The thinness of the custom mouth guard allows for easy breathing and also allows for easy communication. Book an appointment today for a custom mouth guard to protect your children’s teeth and ensure that they unlock the highest level of performance on the field, court, or rink.